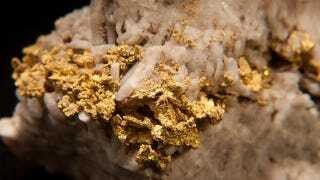 A new study by Australian geologists has shown that over 80% the world's commercial gold deposits were generated in a flash process, the result of depressurizing earthquakes that rapidly converted mineral-rich fluids into precious veins of gold. The process is called flash vaporization. Deep below the Earth's crust, at depths ranging from three to 18 miles (5-30 km), fluid-filled fault cavities are subject to extreme temperatures and pressure. These fluids are rich in dissolved substances like gold and silicate minerals. But for those deposits located near fault lines, an earthquake can create a dramatic drop in pressure which forces the fluid to expand to as much as 130,000 times its former size — and in the blink of an eye. The researchers, a team consisting of Dion Weatherley and Richard Henley, found that this depressurization process causes trapped fluids to expand to a very low-density vapor. This 'flash' effect results in the rapid deposition of silica, along with gold-enriched quartz veins. The fluid cannot get from the surrounding rock into the hole fast enough to fill the void, Henley says, so pressure drops from 3000 times atmospheric pressure to pressures almost the same as those at Earth's surface in an instant. The nearby fluid flash-vaporises as a result – and any minerals it contains are deposited as it does. "Large quantities of gold may be deposited in only a few hundred thousand years," says Weatherley – a brief interval by geological standards. "Each event drops a little more gold," adds Henley. "You can see it microscopically, tiny layer after tiny layer. It just builds up." They calculate that large earthquakes can deposit as much as 0.1 milligrams of gold along each square meter of a fault zone's surface in a fraction of a second. Eventually, over the course of many thousands of years, these deposits begin to accumulate. The researchers estimate, for example, that active faults can produce a 100-metric-ton deposit of gold in less than 100,000 years. Read the entire study at Nature Geoscience. More at Nature News and New Scientist.